Staying active has never been easier with the Star Trac E-SM Stairmill. The stairmill comes with 20 levels of easily adjustable resistance. To keep your workouts fresh and challenging, the stepper comes with 11 workout programs, including the Dynamic Heart Rate Control program which adjusts the workout intensity based on your heart rate for interval training and the Famous Steps program which allows you to climb your favorite landmarks. The dashboard displays your workout information in a 16-character message window with both dedicated and scrolling displays. It comes pre-wired for the E Series entertainment system, which includes iPod integration and USB and coaxial cable connections. Supportive handrails provide a comfortable grip to keep you balanced. Get in shape with the Star Trac E-SM Stairmill! Staying active has never been easier with the Star Trac E-SM Stairmill. 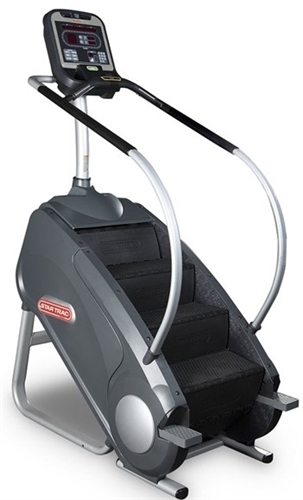 The stairmill comes with 20 levels of easily adjustable resistance. To keep your workouts fresh and challenging, the stepper comes with 11 workout programs, including the Dynamic Heart Rate Control program which adjusts the workout intensity based on your heart rate for interval training and the Famous Steps program which allows you to climb your favorite landmarks. The dashboard displays your workout information in a 16-character message window with both dedicated and scrolling displays. It comes pre-wired for the E Series entertainment system, which includes iPod integration and USB and coaxial cable connections. Supportive handrails provide a comfortable grip to keep you balanced. Get in shape with the Star Trac E-SM Stairmill! Dimensions: 58'' L x 34'' W x 90'' H / Step Height: 8'' / Foot Platform Depth: 9'' / Step Range of Motion: 9'' Fixed Step / Weight: 355 lbs. / Max User Weight: 350 lbs.